Below you’ll find a complete chronology to Doctor Doom comics from Marvel’s 1960’s origins through 2015’s Secret Wars and beyond. Get to know why Victor Von Doom is the greatest comic book super-villain ever created, and as always, enjoy the comics! Of course Doom has a jet pack in his intro! I’d always recommend that any Marvel comics fan simply read the entirity of Jack Kirby and Stan Lee’s Fantastic Four (about 98 issues if memory serves), but since you’re here for the good Doctor, there are plenty of great Doom stories included. 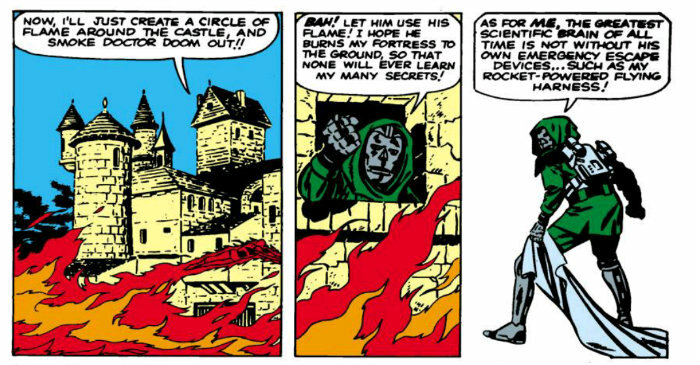 Notably, Fantastic Four #5 includes the origin and introduction of Doctor Doom, in an all-time Marvel classic. Although any Marvel reader worth their salt should absolutely check out the original Amazing Spider-Man comics by Steve Ditko and Stan Lee, for the purposes of hailing Doom, you’ll want to focus on Amazing Spider-Man #5. The 1964 Fantastic Four Annual #2 is particularly notable for expanding the origin of Doctor Doom to what we know and love today. As you’d expect, only Fantastic Four #39 to #40 should be read at this point chronologically, before viewing the essential Doom story in Fantastic Four #57 to #60 below. Fantastic Four #39 to #40 include the classic “And a Blind Man Shall Lead Them,” as Daredevil helps the FF reclaim the Baxter Building from Doctor Doom. Avengers #25 is a story titled “Enter… Doctor Doom,” and if memory serves, is the first time the Avengers battle Victor Von Doom! Fantastic Four #57 to #60 are the absolute must-reads here, as Doctor Doom tricks Silver Surfer into stealing his power cosmic. Dr. Donald Blake sneaks into Latveria to let Doom face the wrath of Thor! Hulk and Doom, together at last! Hero for Hire #8 is a classic, and fan favorite story in which Luke Cage travels to Latveria to force Doctor Doom to pay him the $200 he’s owed. Fantastic Four #142 to #144 features a classic super villain trap from Doctor Doom, by the creative roster of Gerry Conway and Rich Buckler. Then, in Fantastic Four #156 to #157, Doom again manipulates the Silver Surfer into aiding his master scheme. The strangely underrated and overlooked Doctor Doom team-up series that ran through the 1970’s (typically alongside Namor, the Sub-Mariner). 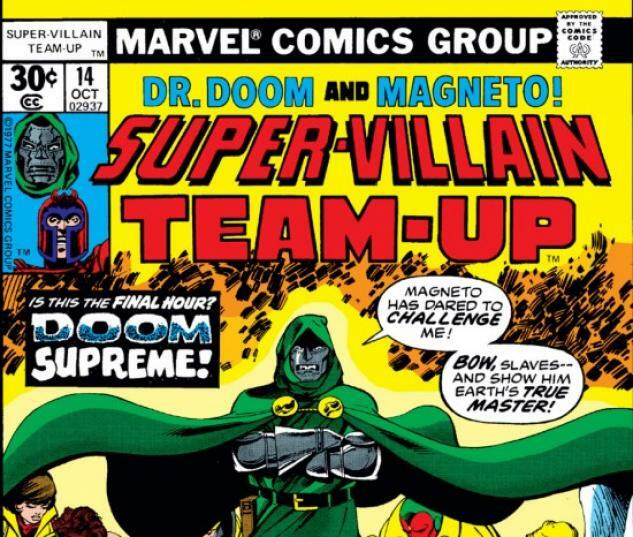 Note that this complete collection of Super-Villain team-up overlaps with the core issues of the Avengers “Private War of Doctor Doom” story below. During the 1970’s Steve Englehart run on Avengers. You’ve never seen Doctor Doom rock an organ so hard, or so magnificently. The Iron Man and Doctor Doom Camelot trilogy! Uncanny X-Men #145 to #147 includes a story by Chris Claremont where the teak takes on Doctor Doom, who takes a particular… interest… in Storm! The John Byrne run on Fantastic Four is worth reading as a whole for all sorts of reasons. The Doctor Doom story titled “Terror in a Tiny Town” is reason enough. The Fantastic Four have to help Doctor Doom regain control of Latveria in Fantastic Four #246 to #247. Issue #246 is titled “Too Many Dooms,” which seems like an absolute impossibility if you ask me. Fantastic Four #258 details a single day from the point of view of Doctor Doom. For a good long time this was my favorite Doctor Doom story ever told. Marvel’s 1985 mega event doesn’t dissapoint for Doom. Fantastic Four #278, aka “True Lies,” explains what Doctor Doom has been up to since the events of Secret Wars, with some serious comic book science! I would quite strongly advise that you don’t try to read all of Secret Wars II as part of the Doctor Doom reading order. In my book, it’s just not worth it. That said, Fantastic Four #287 to #288 (more so #288) take place during Secret Wars II, and are good Doctor Doom reading. If you want the full context of Secret Wars II, you can always check out Comic Book Herald’s complete Secret Wars reading order. The X-Men place the disintegrating life of Kitty Pryde in the hands of Doctor Doom. This series actually had major ramifications for the Claremont X-Men in the coming years. Underrated and perpetually overlooked FF story in which the Fantastic Four and Doctor Doom wrap up the Beyonder / Secret Wars saga! Doom manipulates the Hulk and Thing into a brouhaha for the ages. Roger Stern and Mike Mignola team-up for one of Marvel’s best original graphic novels, not to mention one of the best Doctor Strange AND Doctor Doom stories ever told. As part of the Acts of Vengeance crossover event, Marvel heroes face off against villains they don’t typically see. In the case of the Punisher that means… Doctor Doom! You can see my Marvel Unlimited guide to Acts of Vengeance here. In my book, the greatest Doctor Doom vs. Reed Richards fight in all of Marvel Comics. By the fantastic Walt Simonson. Collects: Doctor Doom Crashes An Avengers Party. By Larry Hama And Paul Ryan (No, Not That Paul Ryan). Unquestionably, Infinity Gauntlet is a Thanos story through and through. As with any story involving a Marvel artifact of ultimate power, Doom makes a play, though mostly reading Infinity Gauntlet sets you up for a more Doom-centric follow-up event. Particular note should be placed on the tie-in issue Doctor Strange: Sorcerer Supreme #34, as Strange and company take on dark shades of Doctor Doom. Doctor Doom and Kang the Conqueror team-up to make a grab for ultimate power! 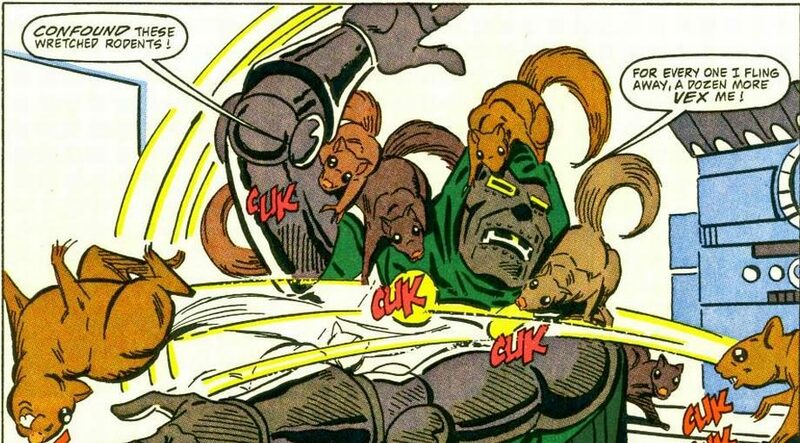 In Squirrel Girl’s first appearance, she takes down Doctor Doom with a horde of squirrels. Doom would very much like to forget this little comic ever happened. Fantastic Four issues #406 to #409 place a clearer emphasis on Doctor Doom prior to the Marvel Universe reset of the Onslaught saga. Almost certainly the comic that gets by purely on my love of Doom’s costume. Following the conclusion of the Onslaught: Epic, Doom finds himself in an alternate reality, which he naturally conqueres. This miniseries details his escape back to Earth. The Waid and Wieringo run on Fantastic Four proves it’s one for the ages early on with this Doctor Doom story. 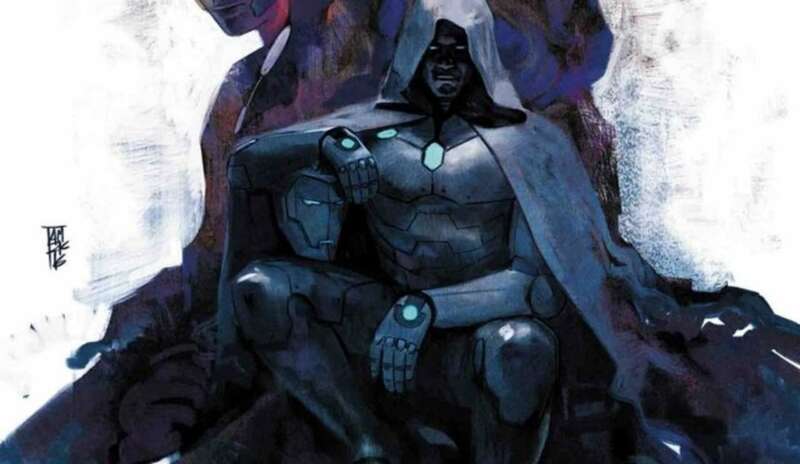 Ed Brubaker and Pablo Raimondi details Doctor Doom’s telling of his origins. In addition to certain issues building towards Marvel’s mega Civil War event, the Fantastic Four tie-ins detail the return of Doctor Doom. To see how this fits in with the rest of the event, I recommend Comic Book Herald’s complete Civil War reading order. Doctor Doom has (seemingly) bombed New York with a Venom bomb. The Mark Millar and Bryan Hitch run on Fantastic Four delivers the teacher of Doom. Shockingly fun series from Paul Tobin and Patrick Shcerberger. Loki convinces Blader the Brave to move Asgard to Latveria. Surely nothing untoward will take place in the sovereign nation of Doctor Doom. Collects: Thor (1966) #604-614, Siege: Loki And New Mutants (2009) #11. Includes the “Latverian Prometheus” story arc, as Doctor Doom continues his grasp for Asgardian power. 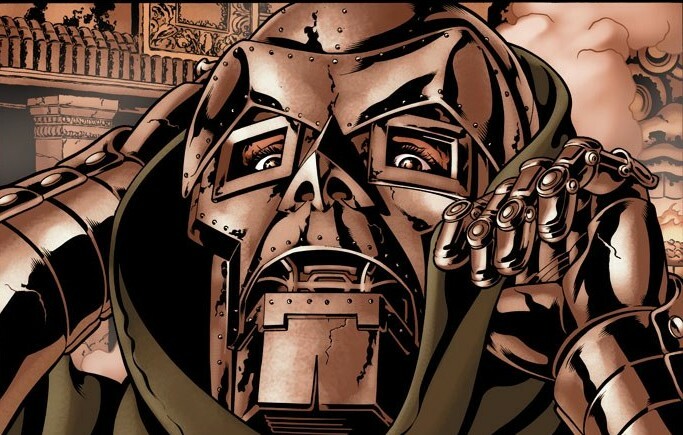 Doctor Doom takes a set at the table of Norman Osborn’s Dark Reign. Doctor Doom vs. Morgana Le Fay, and Doom makes use of his new alliance with the Dark Avengers. Issues of Black Panther #10 to #12 are Doomwar preludes. Essentially a war between Latveria and Wakanda, as Doctor Doom makes a move on the vibranium controlled by the Black Panther. Fall of the Hulks explains Doctor Doom’s connection to the villainous Intelligencia as well as how he reaches the state we find him in Hickman’s FF. You can see the reading order for the full event in Comic Book Herald’s complete Fall of the Hulks and World War Hulks reading order. While Victor isn’t in every single issue of Hickman’s late 2000’s run on Fantastic Four, I highly recommend you read the full run for two reasons: 1) The Doom appearances will make more sense if you read it all, as every issue is interconnected and building to a greater whole and 2) It’s flipping fantastic. All hope lies in Doom! Doctor Doom asserts his place in the events of the Marvel Universe, and the lives of Scarlet Witch and the Young Avengers. The first arc of Ed Brubaker and Butch Guice’s first Winter Soldier series is one of the more unlikely and enjoyable Doctor Doom stories in recent memory. If Victor Von Doom fans want to skip over this collection and pretend it never happened, I won’t say a peep. Issues #3 to #4 feature an excellent story about Doom’s cloned son, Kristoff Vernard, attempting to seek political asylum in the U.S.A. You’ll never guess who he turns to… and who isn’t happy about it. I would highly recommend the entirity of Jonathan Hickman’s run on Avengers and New Avengers, but Time Runs Out is where Doom’s machinations escalate and he works his way towards control of 2015’s Secret Wars. You can find the full Hickman Avengers run and build to Secret Wars in Comic Book Herald’s complete Secret Wars reading order. The post Secret Wars Victor Von Doom appears in the pages of Invincible Iron Man, and experiences significant ch-ch-changes. Squirrel Girl travels through time and fights Doctor Doom (again) in the 1960s. For the full context around Marvel’s Civil War II event, there’s the Comic Book Herald complete Civil War II reading order. In one of the more unexpected turns in Marvel history, Victor Von Doom assumes the mantle of Iron Man. Unquestionably my favorite use of Infamous Iron Man, with Chip Zdarsky and Jim Cheung casting the long time Fantastic Four nemesis as a reluctant advisor to The Thing and Human Torch. The Fantastic Four are back! But what does it mean for Victor? Anybody know anything about this card? Is there any other Error/misprint cards I could refrence? Kind of tangiential, but in She-Hulk #3 (2014), Jennifer Walters attempts to get asylum for Doom’s son, Kristoff Vernard. Very entertaining! What about the heroes reborn story? Shouldn’t be on the list? Finally, I was expecting something like this, thanks.